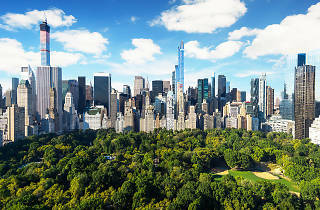 Everything you need to know about visiting Central Park (59th St to 110th St, NY 10023). 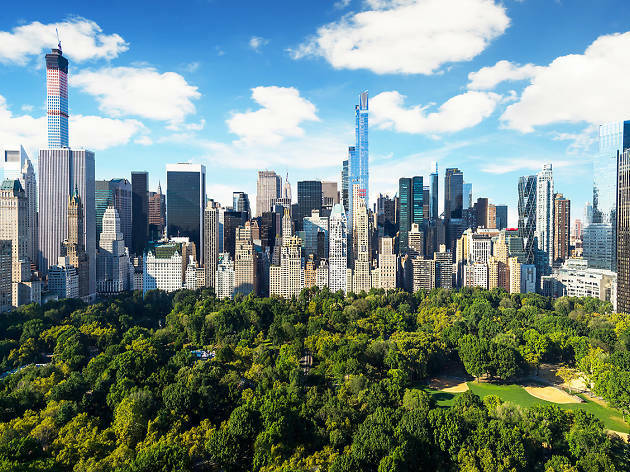 Central Park has it all: 843 acres. Nearly 40 million annual visitors. Twenty-nine sculptures. More than 25,000 trees. The massive National Historic Landmark is located smack-dab in the middle of Manhattan, and it is home to everything from an ice-skating rink to a swimming pool and hosts events like the New York City Marathon and outdoor SummerStage concerts. You could spend days in the park without seeing everything, and it’s open year-round with activities for every season. We could go on—we haven’t even mentioned Belvedere Castle or the Metropolitan Museum of Art yet—but you should really just go see it for yourself. 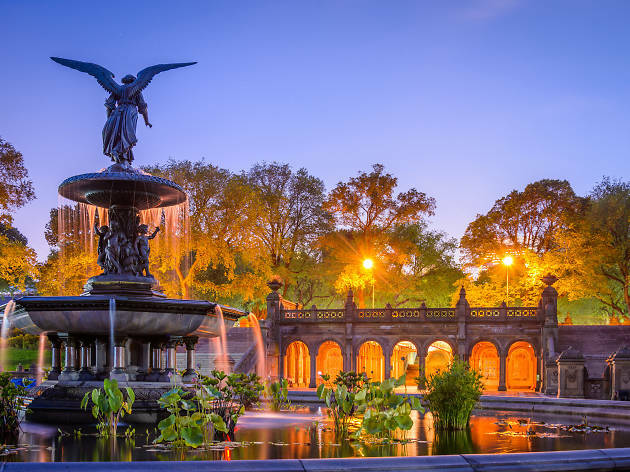 Located on the shore of The Lake at 72nd Street, the picturesque Loeb Boathouse near the equally iconic Bethesda Fountain has been the setting of plenty of NYC movies, and for good reason. But it’s not just a pretty place: There are water sports right there in the middle of Manhattan. Head there to rent a rowboat or take a gondola tour, or just sit at the outdoor bar and sip a cocktail while watching everyone else struggle with their oars. Yes, Shakespeare in the Park is found in this park. The essential free outdoor show is having a prolific 2017, with the much-discussed Julius Caesar and A Midsummer Night’s Dream in July. Yes, you have to line up at the crack of dawn to get tickets to the Public Theater’s productions at Delacorte Theater, but it’s worth it for the experience that rivals the best of Broadway. 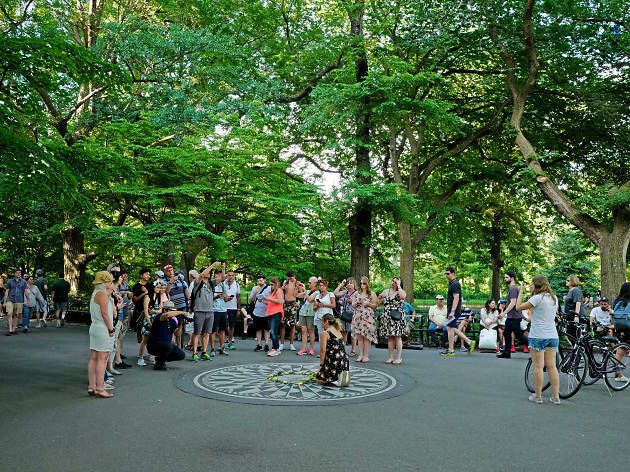 And as a last resort, you can wander Central Park’s Strawberry Fields and Sheep Meadow in search of community theater troupes rehearsing the Bard’s best works. Central Park is so big that there’s an entire zoo within the park, and it’s home to 130 different species. The Central Park Zoo is found at 64th Street, and though it can’t compare to the gigantic Bronx Zoo, it’s worth stopping by to say hi to the snow leopards and grizzly bears. Tip: Even if you don’t have an entire afternoon to spend there, you can walk by and peep at the Sea Lion Pool and the iconic Delacorte Clock with dancing animals from Park Road. Our New York editorial team is constantly updating and reviewing the best attractions, activities and venues across the city, so that you're always in the know, with the best of NYC. at your fingertips. Central Park was most recently updated with new tips on June 19, 2017. Subway: A, B, C, D, 1 to 59th St–Columbus Circle; N, Q, R to 5th Ave; B, C to 72nd St, 81st St–Museum of Natural History, 86th St, 96th St, 103rd St, 110th St; 2, 3 to 110th St.
Beautiful park to go to at any time of the year, especially pretty in Autumn. There are activities for everyone, boating, zoo, ice skating in winter, remote control boats, etc. You can spend hours here getting lost and stumbling across the many bronze statues along the way or simply bringing a picnic and enjoying the quiet away from the hustle and bustle of the city. Central Park is my favorite park of New York City. It spans from 59th Street all the way to 110th! It is a great place to go for a walk or have a picnic. If you enter the park by 59th St., be aware of all the slow walkers and tourists who are probably seeing the park for the first time! Enter the park by 96th St. to see the reservoir and get awesome views of the city. My personal favorite is entering the park on 110th St. and walking by the Harlem Meer. I believe this is the most scenic and quiet part of the park. It is easy to walk through the park and get lost. This is not necesssrily a bad thing, especially if you are trying to seek some relief from the city's craziness. I suggest spending an afternoon in the park and having your camera ready! I think it might be impossible to get tired of Central Park. It's the best get away if you still want to stay in the city. The magic of it is no two visits are really the same. The transformation of the park throughout the year is utterly gorgeous. Don't forget to pack a nice lunch and hit the park for a quaint picnic in the summer. It's a little bit of nature in the heart of the concrete jungle and you can't beat that. Each time you visit central park you will get a different experience, no matter how many times you visit. This is not just another tourist location, it is a place where both locals and tourists come together. The possibilities of ways to spend your day in central park are basically endless. This past weekend was absolutely gorgeous at 60 degrees -- a nice treat this late into Fall! This is one of my favorite times of year to visit Central Park -- no matter which area of the park you explore. You can pay absolutely nothing and simply enjoy the colors of the foliage -- reds, yellows, orange, and green. My friends and I enjoyed a picnic in Sheep's Meadow and then walked around the north-west perimeter of the lake and Bow Bridge. 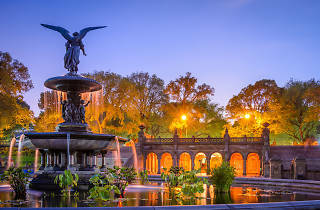 Bethesda Fountain is my favorite spot in the park and there are typically singers performing under the beautiful acoustic terrace. Tip: If you have a CitiBike membership, rent a bike at 59th & Center Drive and you can circle the whole park within the 45 minutes time limit. Beware of the hills in the north-end if you're like me and haven't hit the gym in a while. As much as I love to hate on it, Central Park is really great. It's free, it's huge (so there's always a place to sit) and there's tons of activities inside! Although I think it's awful the horse drawn carriages or those little bike rider taxis are the best way to see the whole park - tourists tend to clam around the 59th street area but if you walk (or take the train) further uptown to the 80's or even 110 it's much less crowded. There's always vendors selling things right outside and inside the park, plus there's a few restuarants you can go to inside. My suggestion would be to eat before, buy a drink or ice pop inside and then absolutely go on the rowboats, its $7 for 30 minutes I think? but regardless it's on the cheap side. Central Park, I love you. I'm always amazed that this already awesome city as a huge park right in the middle of it! It's a beautiful place to escape from the city. There is so much to do. Wide grassland goes on for what seems like forever, perfect for laying down, having a picnic, or playing some sports. Roads are great for walking or bike riding. Not to mention, there is a zoo with a merry go round at the center. The park is ridiculously big, you need a few days minimum to attempt to see it all. There's also rowboating in the summer which is a great solo or group activity. You can also go one step further and go hiking and climbing the rocks to get an elevated view of the park. It's a perfect getaway without leaving he city. The park has so much to offer, there's something for everyone! Central Park is a beautiful, peaceful and entertaining destination sitting in the middle of universal chaos. It offers quiet nature walks, as well as all sorts of entertainment. I saw people dancing, skating, singing, playing musical instruments and much more. I also found a quiet place under a beautiful tree where I could relax and contemplate. A treasure it is. The Jackie Onassis Reservoir is a great place for a walk/run. The track is about a mile and half and has a nice skyline view- perfect for watching the sunset. If you take a stroll after dark, you might be lucky enough to spot a family of raccoons! Central Park is NYC's little oasis in the middle of the hustle and bustle. Sheep Meadow is the perfect area for soaking in the sun if you're not going to make it out to the beach over the summer. And if you're feeling limber enough for a workout, go for a jog around the park and take a lap around the picturesque Jackie Onassis Reservoir. If music is your thing, be sure to catch a show at SummerStage in Central Park. With shows almost every night over the summer, SummerStage is your perfect live music fix. Central Park is like like its own city. From bike riding through the hills of the park to lounging in Sheep's Meadow to visiting the Met, you could spend a day (or days!) in Central Park if you really wanted to... and why wouldn't you want to? Central Park makes you forget that you're in the busiest city in the world, and sometimes we all need a break from the hustle-and-bustle busy city life! My favorite things to do are just stroll around, go to the Bethesda Fountain, walk down the mall, lounge in Sheep's Meadow, ice skate at the rink, and go for a run around the Reservoir. There's also tons to do along the border of the park - the Museum of Natural History and the Planetarium are across the street on the UWS, and there are tons of restaurants like Sarabeths, Serafina, Calle Ocho, and more just blocks from the park! Envisioned as the "lungs" of a future, teeming metropolis yearning for fresh air, Central Park was an incredible act of progressive foresight when it was proposed a few decades before the Civil War. To turn over thousands of acres of prime Manhattan real estate to create a park for the common people was a radical idea in a city that was expanding so rapidly and making so many fortunes for builders and developers. With the creation of the first subways, New Yorkers from the packed immigrant ghettos of Five Points and the Lower East Side could be "in the country" in half an hour for a nickel. Frederick Law Olmstead and Calvert Vaux actually improved on nature, creating dozens of different kinds of locales: broad meadows; dramatic wooded hills; lakes, ponds and streams, formal gardens; grand promenades and ornamental fountains; shady glens; and even a castle and a zoo, all from a swampy, rocky site that didn't remotely resemble parkland. Nearly every "natural" view you see in Central Park was carefully designed and created by the landscapers by rearranging the raw materials and adding whatever was necessary to complete the vision. But it's not just a sylvan retreat from the hustle and bustle of the city; Central Park hosts thousands of events over the year. You really can't say you're a New Yorker until you've sat under the stars watching free Shakespeare on a summer evening at the Delecort Theater (after spending the morning waiting on a long line, getting to know other New Yorkers!). Looks like everything that should be said about Central Park has already been said. However, I will point out that due to the sheer size of Central Park, you will literally encounter something new every time you're here. Grab some comfortable, walking shoes, put in your earbuds, and just allow yourself the pleasure of wandering through the various twisted paths here. You will discover something new to love, I guarantee it. Central Park is an every-season kind of park. Stop and smell the flowers in the spring. Lay out and tan in the summer. Run through falling colored leaves in the fall. Sled down snowy hills in the winter. I feel like I’ve explored a lot of the park, but I am still finding hidden gems. If it’s your first, second or twentieth time visiting the city, be sure to set aside some hours for the park. Need to get away from "the city" without leaving "the city"? Central Park is your escape. Centrally located in Manhattan, this man made park was thankfully an update to the original grid design of Manhattan that had no park. I have run, biked, skated (roller and ice), played softball, seen concerts, seen a polar bear (Zoo), sledded, hiked, seen a Shakespearean play, and ridden amusement park rides all within Central Park. The park has museums along the east side and there are various sculptures throughout the park to view, including a 2000 year old Egyptian pillar. During the summer, grab a place on the Great Lawn and catch some sun while reading a book. Every season is beautiful in Central Park, it's such a wonderful escape from NYC life, right in the heart of the city! You could spend days in there getting lost, it's so big it has a theatre, pool, running trails, play parks... I'm missing loads, but you get the point. You'll find something new every time you visit. It's a great place for running and biking too. The road around the park is around 10K and in the summer, the water fountains are on and periodically spread out, so you're well covered on hot days! You'll notice the park get really busy as marathon season picks up, it's a firm favorite for runners. Biking is really nice in there too. It's well patrolled by police though which helps keep speeds to a sensible level and red light jumpers down! A stunning oasis in the centre of Manhattan, great for escaping the city without really escaping the city. I've lived across the street from Central Park for about two years now, yet every time I venture in I discover something new. It's the most transformative venue in the city. Whether you want to see a concert, host a brunch, go to the zoo, get a workout in, go ice skating, or see a play, it can all be done at this location. In addition to checking out all of the monuments scattered throughout, there's always an event being held in the park. You can find a full list of events at: http://www.centralparknyc.org/events/. To any New Yorker that hasn't visited Central Park, I really have no idea what you are waiting for. You know, there are a lot of other parks in NYC, but that's not to discredit Central Park in any way. I live in Brooklyn, with easy access to nearby Prospect Park, and I still make the journey to Central Park on occasion. I have lounged in the grass and napped under trees, had picnics, watched softball games, thrown a frisbee, waited for hours in line to get free tickets to Shakespeare in the park...Central Park makes life better for New Yorkers. I hate to think of what people would be like without this massive respite in the center of the city. Central Park is a sweet haven that every New Yorker appreciates and treasures. It's an immeasurably valuable respite that's not only gorgeous but one of the only places in the city you might be able to actually find a place to be completely alone. When you're surrounded by concrete and thousands of people all day long, it's incredibly cleansing and rejuvenating to walk under shady trees for hours, getting lost, stumbling upon lakes and hidden castles, watching athletes duke it out on the baseball fields, or my personal favorite, laying out a giant blanket and eating my weight in cheese and charcuterie while someone plays guitar nearby. After a snowstorm, it's ethereal. I enjoyed my visit to Central Park! Great all year round, but especially in the spring/summer time... All I gotta say is, rowboats. Do it.